I'm back to cutting and sewing today... during the spare moment when I'm not taking kids swimming and making a lot of meals... everyone is so much hungrier in the summer! In between storm clouds this afternoon, I've been trying to photograph and put together a little tutorial for you on the child's travel pillow. Hope to have it up tonight with a summer give-away! See you then! Oooh, I was hoping you would do this! I can't wait (no pressure, lol). This one is absolutely adorable. Did you make the doll too? It looks so wonderful in that fabric!! Can't beat the little tucked in baby either. Thank you. I love the little doll peeping out of the pocket. Maya this is perfect! Emma leaves for camp in a little over a week and this will absolutely perfect for her. (She wanted me to make a quilt, but honestly!) Look forward to the tutorial! P.S.- I made 5 buckets today! I'm writing a post about them now. 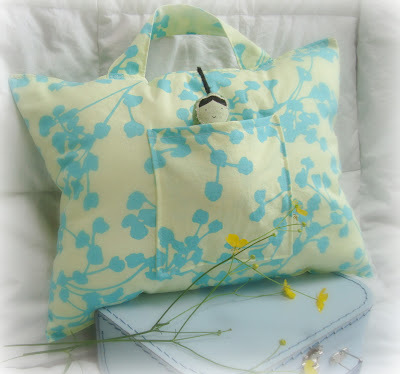 that is so lovely in that fabric with the buttercups and small suitcase. I wish my not so little one was going away to camp this year so I could send her off with a travel pillow. Hope your finger is doing well .